Magritte’s comments on our fascination with the unknown rings true not just in artistic surrealism, but also in many of our scientific research endeavors. The human mind is continually fascinated with what it has yet to understand, and curiously enough, the human mind itself is one such mystery. However, recent efforts focused on imaging and analyzing the entire brain, performed by both scientists and artists alike, have helped shed some light on this mystery. With this new technology, however, comes the question of how neuroimagingTechniques for viewing the brain and its activity, especiall... can influence the perspectives of a sentient being. What does it mean to see a reflection of our own cognition, both for our understanding of science and for our perception of humanity and living creatures? Researchers around the world have sparked much of this discussion through the development of unique neuroimaging techniques across both art and science, as well as unconventional applications of previously established techniques. One particularly novel approach to neuroimaging has been developed by a group of researchers at Stanford University lead by Karl Deisseroth, who have aptly named their new technique CLARITY. CLARITY has been used on the brains of zebrafish and mouse models, as well as on samples of preserved human brains. It essentially turns a brain transparent. With this technique, researchers can now analyze the delicate neural architecture of the brain without the need to dissect and section it into pieces. The method essentially relies on the brain’s use of lipids, which are fatty molecules that help to form cell membranes. They are difficult to look through or penetrate using chemicals and light, but if they are removed entirely, the rest of the tissue that depends on its scaffolding would crumble apart. What these researchers have done instead is to submerge a brain or brain sample into a solution of something called hydrogel, a highly absorbent and hydrophilic (water-loving) compound. The brain sample is then exposed to heat that resembles normal body temperature, at which point the singular hydrogel compounds can congeal into longer, branched molecules called polymers. These polymers form a mesh throughout the brain, essentially becoming a kind of scaffolding for the rest of the neural tissue, without binding to any of the lipids. In this way, lipids may be removed without destroying the structure of the brain. Once the hydrogel mesh is in place, researchers can extract the lipids using either passive chemical methods or active electrophoresis techniques. Brain samples can be passively incubated with an ionic detergent whose molecules will passively diffuse into the tissue, bond to the fatty lipids not connected to the hydrogel mesh, and then passively diffuse back out of the tissue. As you can imagine, however, this technique can take a long time – from weeks to months depending on the sample size. Researchers can instead employ a more rapid technique called electrophoretic tissue cleaning (ETC). The concept is essentially the same, except the sample is now placed in an electric field. The ionic detergent molecules are negatively charged and will travel away from one electrodePart of a circuit that conducts electricity and contacts a n... (which repels them) and towards the other electrode (which attracts them), passing through brain tissue and carrying lipids back out in the process. Naturally, this technique may be faster but comes with the risk of tissue damage if the equipment malfunctions or the protocol is not performed correctly. Once all the lipids have been removed, what’s left is a transparent brain with all the neural details left intact (neurons, axons, dendrites, synapses, proteins, nucleic acids, etc.). Turning brains into a transparent gel of neural networks is a really neat party trick, but it also does changes how we approach neuroscience research. It ultimately promotes a more holistic approach to neuroscience, meaning that the entire brain as a whole can be better examined in diagnoses and studies. 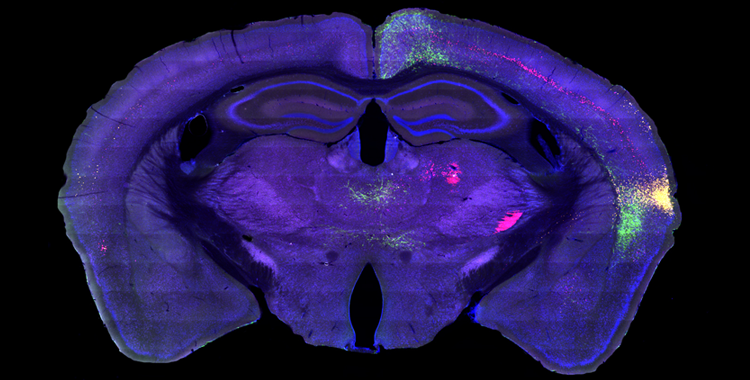 Examining the neural architecture of an intact brain could help identify specific neurons and how they contribute to function, behavior, and development. New neural pathways could be studied and pre-existing neural pathways could be better analyzed. This new imaging technique also allows researchers to look at the relationships among cells and subcellular structures, protein complexes, nucleic acids, neurotransmitters, and other signaling molecules. It even promotes a more efficient use of fluorescent antibody staining, a research technique that utilizes specifically designed antibodies that bind to target molecules. With this technique, multiple stainings can be done on one brain sample. Researchers can simply flush out certain antibodies and then repeat the staining process with different antibodies of their choosing. CLARITY could even be applied to cancer biopsy studies, where researchers are looking to examine the 3D dynamics of cancer cells through various stages of cancer development. The brain may not be the only organ that can benefit from this technique, either. It has the potential to be applied to other organs, enabling a better view at an entire organism and its physical and molecular pathways. Even in its singular use on the brain, this kind of neuroimaging technique can contribute to our understanding of neural development, function, self-repair, disease, and more in the brains of humans and other species. While the scientific and medical boons are clearly plentiful, this new capability to essentially see a reflection of our own brains also speaks of another experience entirely. In addition to being able to track down molecules traveling throughout the brain, the capability to see a creature’s seat of cognition and consciousness is a truly profound experience. There are many ways that people have attempted to process this new perspective, be it through further scientific research or the dynamic medium of art. If you’ve ever seen a shimmering rose gold or multicolored brain floating around the internet, then you’ve probably been staring in awe at the work of scientist and artist, Greg Dunn. His most recent piece, entitled Self Reflected, is a microetching of the brain that utilizes neuroimaging to both fascinate and educate an audience about the beauty and marvel of the brain. The project, funded by the National Science Foundation, has artwork available for purchase on Dunn’s website. Greg Dunn started out as a graduate student in neuroscience at the University of Pennsylvania, where he began to appreciate the complex biology of the brain in a wonderfully interdisciplinary fashion. His fascination with Asian art and neuroscience compelled him to collaborate with Brian Edwards and many neuroscience colleagues to create a depiction of the brain and its neural networks using a conglomeration of research methods and artistic mediums. These microetchings are essentially sheets of gold that are engraved on a microscopic scale, with the color and brightness of the engravings depending on how the piece is lit and what angle it is being viewed from. This piece in particular depicts an oblique sagittal slice of the brain (a slanted slice through the brain from the top of the head to the bottom). Self Reflected (The entire Self Reflected microetching under white light. ), 22K gilded microetching, 96″ X 130″, 2014-2016, Greg Dunn and Brian Edwards. Photo by Greg Dunn and Will Drinker. Dunn’s microetchings depict how interconnected and beautifully woven neural connections can be. The artwork serves as a foundation and a stepping stone for people to understand just how delightfully complex the human brain is, but the title alone hints at a greater philosophical meaning, as well. Self Reflected is a clever title that implies a deeper sense of introspection that accompanies scientific understanding, particularly with respect to human biology. At the same time, it inspires us to establish a foundation for self-exploration and introspection in neuroscience. Dunn specifically mentions that he did not create the work as a means of simplifying the brain, but rather to promote its awe-inspiring nature by making its complexity transparent. Indeed, Dunn’s artwork can be seen as the artistic accompaniment of Deisseroth’s CLARITY, both endeavoring to make the brain transparent in unique ways. Not only does Dunn’s work spark philosophical contemplation, but it also holds important scientific value. In the process of creating these images, Dunn and his colleagues gained important insights into how the brain’s structural elements impact the function of neural pathways. For instance, the rhythmic, wave-like firing patterns of neurons in the brain is directly linked to neural organization. Neurons that are next to each other also tend to be connected to each other, as well as to distant neurons through long axons. A signal in one cluster of neurons can thus propagate outward through this structural network, creating a wave-like pattern of activity. The structural characteristics of these axonal pathways is also dictated by the brain’s geometry. Up close, Self Reflected depicts this beautifully. In regions of the brain that have a more concave 3D curvature, axons have little room to breathe and travel, causing them to bunch up and appear denser on the microetching. This axonal density is best visualized in Dunn’s close-up of the cerebellumBrain structure involved in coordination, balance, posture, ..., in which concave, finger-like structures (known as folia) appear very compact. In areas that have a more convex 3D curvature, axons are looser, indicated by dark spaces between the folia. Self Reflected (cerebellar folia- the laminar structure of the cerebellum, a region involved in movement and proprioception, calculating where your body is in space), 22K gilded microetching, 96″ X 130″, 2014-2016, Greg Dunn and Brian Edwards. Furthermore, these visualizations also highlight the wonderful contrast between organization and chaos in the brain. This chaos is best seen in an accompanying video of the piece, which utilizes a highly complex algorithm to simulate neural circuitry across the microetching. By combining computer engineering, coding, and neuroscience, Dunn was able to create the very image of randomized chaos in a clean and crisp artistic format. The chaos of the human brain shows up time and time again, across various mediums, both scientific and artistic in nature. Yet other studies have found that the human brain is not alone in this complexity. While we may take pride in the uniqueness of the human brain and the complexity which gives rise to our intelligence, these new neuroimaging techniques have also revealed just how chaotic and complex other species’ brains are. It hints at a greater connection among all species on this planet, from the tiny fruit fly to the human self. Having this new capability to see and experience the brain of a living organism can thus become an intriguing and humbling experience for much of humanity. There is no doubt that the advancement of technology and the eternally curious minds of humanity will keep propelling us into new kinds of discussions about who we are, what that means, and what our place is on this blue marble in space. Today, it might be the new frontier of better neuroimaging, allowing us to glimpse the unknown which we are so innately drawn towards. Tomorrow, it may be yet another means of humanity’s self-reflection. Along the way, science will surely not be alone in these pursuits – after all, it is typically through interdisciplinary collaboration that some of our best epiphanies are cultivated. Chung, K., & Deisseroth, K. (2013). CLARITY for mapping the nervous system. Nature methods, 10(6), 508-513. Landhuis, E. (2017). Neuroscience: Big brain, big data. Nature, 541(7638), 559-561. Glasser, M. F., Coalson, T. S., Robinson, E. C., Hacker, C. D., Harwell, J., Yacoub, E., … & Smith, S. M. (2016). A multi-modal parcellation of human cerebral cortex. Nature, 536(7615), 171-178. Alexa Erdogan has been enraptured by final frontiers ever since she was young. It likely explains why she ended up combining her two loves for neuroscience and outer space into the pursuit of a new final frontier: space neuroscience. Outside of research, she tries to share her passion for science with other curious minds using science communication across various media, from print to podcast.